Growing marijuana indoors gives you a lot more control over the environment and, therefore, the finished product, but the costs of covering the electricity for indoor cannabis growers can be astounding. Let’s face it, all of the ventilation, dehumidification, air conditioning and irrigation takes lots of electricity, but luckily, there are many options that can help to make your operation more energy efficient. One of the biggest areas of potential saving is with your lighting system. The two most popular grow lights are HPS and LED, and either one can be an excellent choice for your grow operation. HPS Grow Lights – HPS grow lights are best known for producing lots and lots of light, which is incredibly important for flowering plants. The downside of HPS grow lights is that they also produce lots of heat, requiring more ventilation equipment. 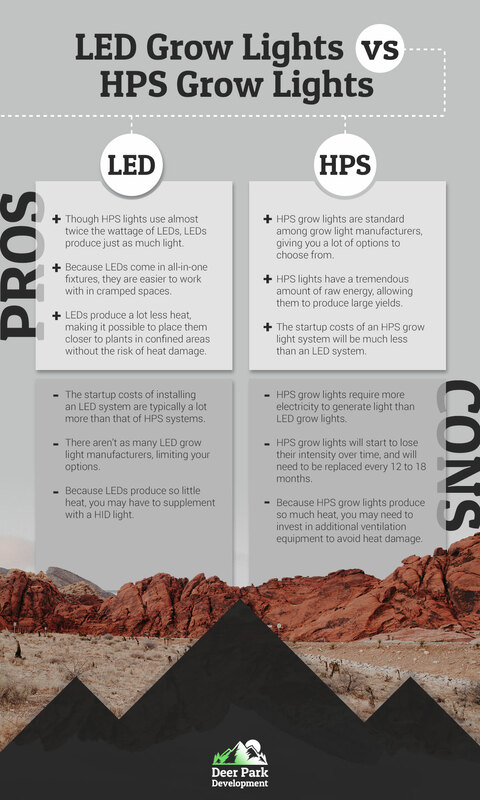 HPS grow lighting systems are generally cheaper to set up, but they require more electricity than LED grow lights to run. LED Grow Lights – LED grow lights are the most efficient grow lights on the market, and they can help you save more every month on your energy bills. However, the startup costs of installing an LED system can be expensive. And, since LEDs produce so little heat, you may need to add in extra heat by installing a HID light for cooler indoor areas. One of the best things you can do to make your grow facility more energy efficient it to take advantage of solar energy. While solar energy systems used to be costly, they have become much more affordable in recent years, and they are a great investment. Another great way to save more energy on your grow operation is to build an energy efficient greenhouse. Growing in a greenhouse allows you more control over the environment and more reliability, but for a significantly lower startup cost than a typical indoor grow facility. Plus, since greenhouses primarily use the sun as heat and light, you’ll use a lot less energy, leading to monthly savings. The lighting and electrical systems you choose for your grow facility can have major implications on your startup costs, as well as your monthly energy expenses. But, without the right property to cultivate your marijuana, it doesn’t matter what kind of lighting and electrical system you invest in. If you’re in the market for cannabis land for sale, contact us today! ©2018 Deer Park Development All rights reserved.